The paintings of Fernando C. Amorsolo “…overflow with sweetness and optimism,” says art historian Eric Torres. Amorsolo, Torres asserts, managed to “capture on canvas the vibrant tropical Philippine sunlight.” A shy man, whose only real genius was in painting, Fernando Amorsolo also helped shape and stylize the image of the ideal Filipina. Fernando Amorsolo’s enormous popularity, both during his lifetime and after, resulted from his luminous and idealized treatment of Philippine genre and landscape subjects. His best-known paintings feature peasants in colorful costumes, scenes of rice planting and harvesting, genre and society portraits, and sensual female bathers. 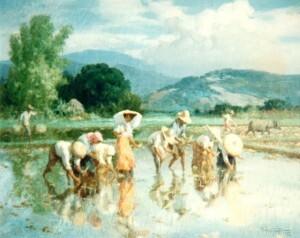 Amorsolo’s painterly technique, and his skill in rendering the figure, is said to have peaked during the era known as his “Golden Period” between 1915 and 1940. Fernando Amorsolo was born on May 30, 1892 in Paco, Manila to Pedro Amorsolo, a bookkeeper, and his wife Bonifacia Cueto. One of five brothers, Fernando grew up in Daet, Camarines Norte, until moving to Manila upon the death of his father. Before he passed away, Amorsolo’s father Pedro had made his wife promise to give Fernando a proper art education. The family moved in with his mother’s first cousin, Fabian de la Rosa, a genre painter who had been trained at Manila’s Escuela de Bellas Artes y Dibujo (School of Fine Arts and Design) and who had also traveled in Europe. In 1905 Fernando Amorsolo, aged 13, was apprenticed to de la Rosa. The young man’s first commercial success came when he sold watercolor postcards for 10 centavos each. In 1908, Amorsolo won the second prize for the painting Levendo Periodico at the Bazar Escolta, a competition sponsored by the Asociacion Internacional de Artistas. The following year, Amorsolo enrolled at the Art School of the Liceo de Manila where a genre scene of figures in a garden would earn him a first prize in his graduation year. In 1909 he began attending the University of the Philippines School of Fine art, where his uncle Fabian de la Rosa was serving as an instructor. During his university years Amorsolo supported himself by doing illustration work that appeared in novels and religious publications. He graduated with honors in 1916 and began a dual career as an art instructor and commercial artist. After returning to Manila, Amorsolo set up a studio and began an enormously productive period. Using subject matter that he had borrowed from Fabian de la Rosa – scenes of rice planting and harvesting — he created a series of paintings that captured the popular imagination. His 1922 painting Rice Planting soon appeared on calendars, posters, and travel brochures. Amorsolo also created powerful images of Philippine colonial history including “The First Mass in the Philippines.” During the long span of his career, Amorsolo’s paintings would continue to be reproduced in textbooks, commercial images, magazines and newspapers, and became the accepted standard for historical imagery. Commercially successful from his thirties on, Amorsolo was the subject of international exhibitions including a one-man show in New York City held in 1925. He was very much in demand for portraits of society figures, including foreigners, and was willing to make copies of his own works, always slightly altered, on a commissioned basis. He would sometimes bring out a photo album of his better-known paintings and ask a client which subject matter they would like. Amorsolo continued to teach at the University of the Philippines, and served as the Director of the school’s Art Department between 1938 and 1952. After the 1931 death of his first wife – with whom he had six children – he remarried and fathered eight more children. In total, five of his children also became painters. During the Japanese occupation of the Philippines Amorsolo sketched war scenes from the window or roof of his rented apartment, while his wife and family lived separately in a safer location. His drawings and paintings from this grim period document wartime suffering and atrocities. In particular, Amorsolo depicted the sufferings of mothers and children. During the war, Amorsolo’s younger brother Pablo, also an accomplished artist was branded a Japanese sympathizer and was executed by Filipino guerillas. His wartime paintings are considered among his finest work and were exhibited at Malacanang Palace in 1948. 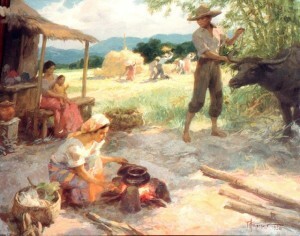 A 1954 Amorsolo oil painting depicts Philippine village life. From the 1950s onward, Amorsolo created an average of 10 paintings per month. His popularity was so great that the first generation of Philippine modernists generally cited his work as an academy that needed to be rebelled against. In a sense, this was a kind of compliment to the aging artist. 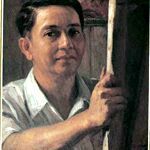 In Amorsolo’s waning years health problems, including diabetes and cataracts, created obstacles, but he continued to paint productively to support his large family. The deaths of two of his sons, Fernando Jr. in 1964, and Milo in 1971, affected him deeply. Fernando Amorsolo died of heart failure on August 24, 1972. In 2003, Amorsolo’s children founded the Fernando C. Amorsolo Art Foundation, which is dedicated to preserving Fernando Amorsolo’s legacy, promoting his style and vision, and preserving a national heritage through the conservation and promotion of his works.